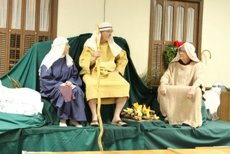 Short-christian-skits.com provides short christian skits and comedy sketches for use in church, Christian meetings and evangelism. Below are just a few of the churches and individuals who've performed our sketches. 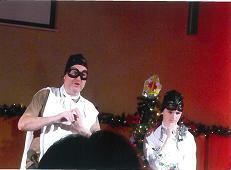 I performed the Angels sketch yesterday with my fourteen year son for Yardley Baptist's Carols by Candlelight service. We wore a costume of a biggles flight cap each with goggles and white angel costumes (on my legs I had to girl's white tutus, one for each thigh.) 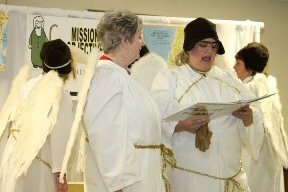 The sketch was very well received with a number of people loving the punchline about Mary. "Thanks so much for the excellent Shepherds sketch. We performed it last night at our carol service and it went down a bomb! As well as being very amusing yet to the point, it suited our actors well, with one main part and two very small one-liner parts. Thanks, Matt." - Matthew Ross. Hinkley Baptist - "The sketches went down a storm!...very accessible sketches with a clear message to develop... We will definitely be doing more." Kate Philips. Reachout Community Church - Wellingborough, Northamptonshire. - "I am really impressed. The scripts are excellent; topical, comical, thought-provoking & scriptual." Tim Tompkins. 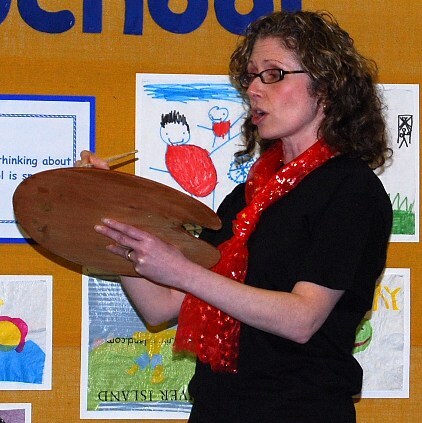 It was an absolutely wonderful show held in the local school for 2 nights. Completely packed both nights and I have to say I thought one of the best shows we have ever put on. We used 4 of your sketches. The Shepherds was hilarious, the best sketch of the night. In Wise Men the Shop Keeper was kind of a Chav Scouser. The Christmas Cards sketch was right at the very end. We played it as "The Vicar of Dibley & Alice" in their final joke section after the show and the audience absolutely loved it. I played The Vicar and i have to say I totally milked the whole thing it was great. 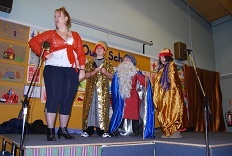 The money we raised from the show went to "Water Aid" and our local "St Ann'e Hospice. "So many many Thanks for providing such great material. - Denise Bartholomew, Churches Together in Boothstown, UK. Summer Camp, California - "You did a great job! I love your stuff! If you are ever in Southern California, I'll buy you dinner. ........." Frank Macy, Minister, Church of Christ at Orange, California, US. We are W.O.W.Y. (Walk on Water Youth) from Summerfield North Carolina. Our teens are loving the skits purchased for them. - Rosemary Kenchel. Plymstock United "We are a group of six elderly people and performed "Bring it to God" and "Clothes Shopping" when my Home Group were responsible for the evening service. Both were well received." Sheila Wood. 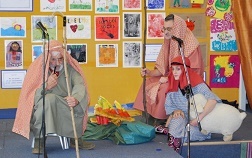 Well the three wise men skit went down a treat at our church! Alas there aren't any photos- which is a shame as our false beards and knitted jumpers were spectacular! Next time we use a sketch tho I will make sure that photos are taken! - Samantha Taylor. 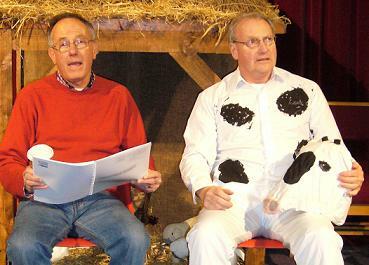 "We performed 'Anorak' in 'The Revue' which took place at the end of our theological training. The young couple were played by a long-married (both ordained) couple in their sixties, and the vicar by myself. That juxtaposition, of course, added to the humour of those present. It was very well received, and comments included the appreciation that the humour was well judged, and did not cross the border to the inappropriate. Many people also noted your name when they found out where the sketch came from. As we are all taking up our curacies at present, I hope that your name will be remembered and more of your excellent work used in our ministries. Thank you for the work you do - I will certainly consider utilising other sketches in the future." 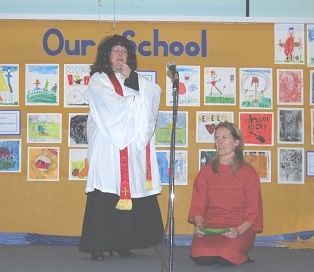 Lyn Bliss - now NSM curate in the rural parish of Bucklebury, Bradfield and Stanford Dingley in Berkshire.